Pavlov would be proud. Your doorbell rings and your pint-sized pooch, Moxie, screams like a banshee. You smile, thinking how cute she is guarding your home and hearth. However, the barking continues as you usher your guest inside, grab some beverages and finally scoop Moxie up in your arms. What gives? 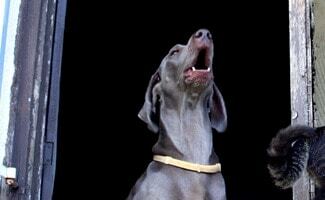 The mystery of why dogs bark has many reasons, but our reaction to the din determines what happens next. This dog looks straight at your face, barks rhythmically, and stamps his feet. Imagine his angst as you say, “What, buddy? What is it you want?” Fido keeps it up until you lose patience and begin to yell back. Since the dog barks right at your face, he isn’t alerting you to a bad guy outside, or saying he has to go potty. My guess is, Frustrated Fido wants some quality playtime, and tossing down a chew bone isn’t what he has in mind. Interrupt the barking the second it starts by grabbing a wonderful toy the dog only sees when you play together. Sprinkle in commands like Sit, Come, Down and Back Up, to ensure the dog earns his prize. The toy is the directional cue; move it where you want the dog to move and it happens like magic. 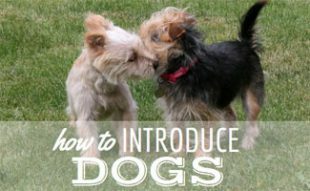 Try to anticipate the time of day the dog displays this behavior (after dinner is a favorite time for most dogs to get a case of the ‘crazies’), and you can initiate fun, interactive play on your terms and skip the whole barking preamble. This dog figures the best defense is a good offense. A larger dog approaches with a softly wagging tail and friendly body language, but tiny Fluffy raises her lip, barks and snarls hideously until the overture is withdrawn. The clue here is Fluffy’s body language. If she is backing up while barking, or turning sideways and looking over her shoulder, or moving behind your feet, she is looking to get away. Try to have Fluffy associate being around casually friendly dogs with something positive, like getting great treats. Hold a meat or cheese treat in each hand and position yourself between the two dogs. Ask for ’Sit’, then offer each a treat simultaneously from each hand so they stay apart. Practice this with a friend’s tolerant pooch and soon Fluffy will see the benefits of better social skills. Take a little stroll with the other dog and owner so Fluffy can shake off her anxiety. This is the pint-sized pooch that screams at everyone until she is picked up, and may even continue until she is shut in a bedroom by a desperate owner. This dog needs a job. Attach a leash to Diva Dog at least twenty minutes before your guest is due to arrive. Grab a few tasty treats and practice your Come command, moving back away from the door and coaxing her toward you. Knock on the door from the inside and do it again until the dog doesn’t bark at all when you knock. Now, when your guest arrives, demonstrate her new found knowledge and she’ll get the positive attention she craves. You have successfully redirected this barking into a task that gets her noticed, in a very good way. 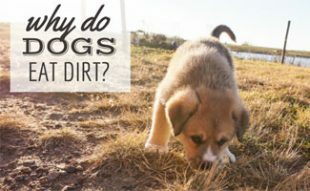 Have More Why Dogs Bark Questions for Amy? 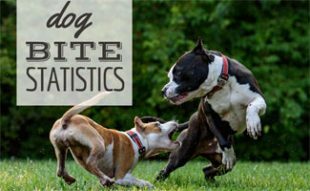 Please comment below if you have your own personal stories to share about why dogs bark and follow this article’s author, Amy, on Twitter or Facebook. Amy has over 100 training videos, TV appearances, adorable puppies playing and product reviews on her Youtube channel. My 5 month old Bernese mountain dog puppy barks incessantly at everyone who comes in the house she doesn’t know. However once she knows someone she’s their best friend. She shies away when the visitor tries to pet her or gives her attention and acts very fearful. She’ll back away, looking around and be very skittish. She is very a vocal dog and sings in the morning, whines/cries when I come him and barks at passersby in our house. Does anyone have any tips to make her more comfortable and stop the defensive barking with our guests? Admittedly, too much barking can be annoying especially to your neighbors. That is why pet owners should know the right approach to teaching their dogs to be quiet when they command them to. Your information is fantastic. I am happy to learn more about canine behavior. And after seeing your picture you are a hot author too! 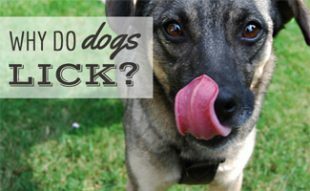 It is so great to finally understand the reasons why dogs will bark. I take care of a friend's dog and he is real noisy barker. Thanks to you I have a better idea of what to do and how to handle his barking!